When this Impostor thinks of combining “alcohol” and “boats,” I usually rifle through the altogether depressing statistics assembled by the Coast Guard (more than 50% of recreational boating accidents involve alcohol), envision dead manatees, or, by virtue of making a mental U-turn, I think of Gilligan’s Island, The Poseidon Adventure, and The Love Boat. 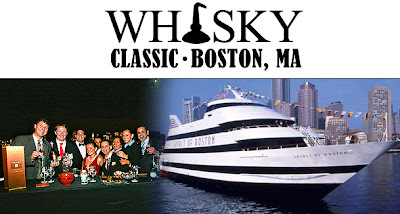 Although the weather was inopportune for a May night, the Whisky Guild’s Boston Whisky Cruise three hour tour was fortunately akin to taking the Love Boat—minus the romance—and as far as I know, not a single inebriated person fell off the boat, even if plenty of us were reeling around in besotted ecstasy. superb, and the selections of expressions were outstanding. Except for a Laphroaig 10 bottled in the 1960’s—shades of Mad Men—I hardly had a dram aged less 17 years. Blah, blah, blah: There are younger scotches I adore, but the older ones are certainly rarer, considerably more expensive, and possibly where the real expertise and creativity of the Malt Barrel Nosing and Mixing Masters find their greatest outlet. Although it is all a happy blur to me now, like most of my college years, and my high school years, and sadly, even my elementary school years, there are a few standouts for me. Note that an omission from this list means nothing except that the cliffs of my memory are inadequate to the task of standing neuronally firm in the face of the erosion occasioned by many, many lapping waves of the water of life. In no particular order, I was delighted by the 1991 Balblair, the Compass Box Hedonism, the Brian Dvoret’s running a latitudinal tasting of Scott’s selection bottlings, starting with the Lowlands and moving to the Highlands, including a sublime Glenlivet 1977 and a great Bruichladdich 1990. Our thanks to Jeffrey Karlovitch and The Whisky Guild for their tremendous hospitality and for a great event!